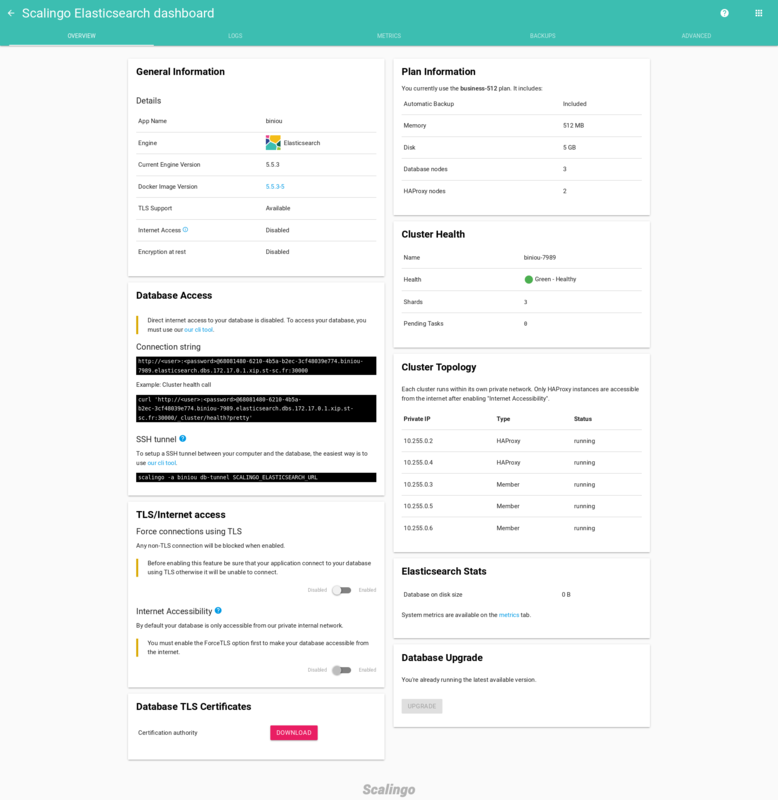 Elasticsearch is the official addon provided by Scalingo. Details on the available plans can be found here. This addon gives your app instant access to an Elasticsearch database. You can add the Elasticsearch addon through the Dashboard or through the command-line interface. The capacity of your database is elastic, you will be able to upgrade it later. This command will provision the application my-app with a 1g Elasticsearch database plan. a couple of HAProxy as entrypoint to the Elasticsearch private network: one is the master and the other is just here as a backup in case of failing master. The communication between the Elasticsearch nodes is encrypted. 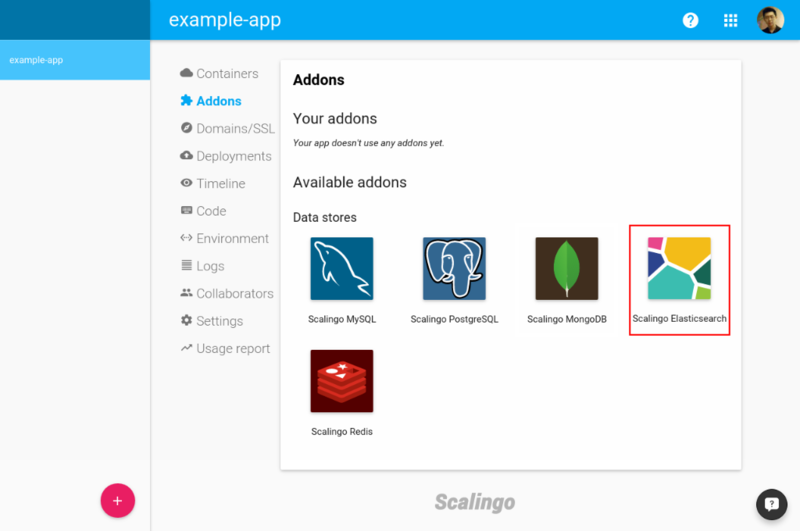 Once the addon is provisioned, 2 environment variables are added to your app: SCALINGO_ELASTICSEARCH_URL and ELASTICSEARCH_URL. ELASTICSEARCH_URL is an alias to SCALINGO_ELASTICSEARCH_URL. To find out how to use it in your code please refer to Application environment. The difference between this data storage engine and the others is that Elasticsearch communicates over HTTP, so you can use any tool built for that. You don’t have to use an official client. The most common command line tool is curl. The following example uses it. 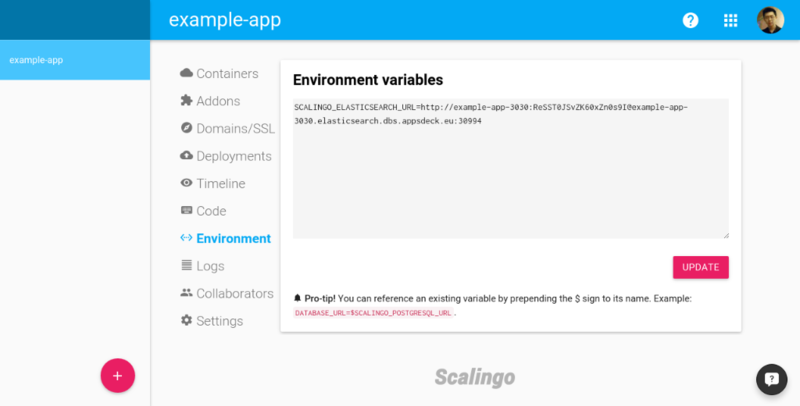 If my application’s name is ‘my-app’ and it has the environment variable SCALINGO_ELASTICSEARCH_URL = "http://my-app-123:H_grwjqBteMMrVye442Zw6@my-app-123.elasticsearch.dbs.scalingo.com:30000/my-app-123"
Our Elasticsearch image support TLS to encrypt all of its network traffic between the client and the server. With URL starting with https://. The --insecure option is mandatory as the generated certificates for your databases are self-signed. If you want the certificate to be trust-able, you need to download our certification authority certificate and specify it to the MongoDB CLI tool. The certificate of our certification authority is available on the database dashboard. curl --cacert=/path/to/ca.pem -X GET "<URL>"
This operation is similar to changing your database plan. Your database will be stopped and restarted with the new database version. When this operation finishes, your application will be restarted. If using a Business plan for your Elasticsearch addon, we are able to upgrade your instance to a newer version without downtime. In order to do so, we follow Elasticsearch guidelines. We first disable the shard allocation in the cluster. Then we shut down and upgrade the first node. After upgrading the plugins and restarting the node, we can safely enable back the shard allocation in the cluster. Last we wait for the cluster to finish the shard allocation before going through the same sequence of actions for the next node. Elasticsearch backups cannot be downloaded. This restriction is imposed by the internal working of Elasticsearch and we cannot circumvent it.